A UC Santa Cruz college born of the environmental movement is named for the writer who inspired it. College Eight at UC Santa Cruz was born embracing environmentalism. Now it’s getting a name befitting that passion: Rachel Carson College. 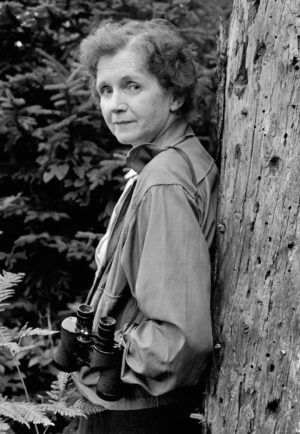 Rachel Carson, writer and conservationist, is widely credited with launching the modern environmental movement. Her 1962 book, Silent Spring, dramatically chronicled the damage caused by indiscriminate application of chemicals in the guise of controlling pests. Her larger theme: humans are a part of nature—not its masters. It establishes an endowment to ensure the college can provide opportunities for students in perpetuity and establishes a chair in ecology and environmental justice. Concurrently, citing the impact of Carson’s writings, a chair in science communication is also being created. The gift package totals \$7 million. Though Rachel Carson would not live to see its evolution, she ignited a new sensitivity and sensibility about the natural world. The toxin DDT would be banned and the use of many other lethal chemicals monitored and regulated. In 1970, the first Earth Day was held and the U.S. Environmental Protection Agency founded. College Eight quickly established its reputation for excellence in environmentalism. Its alumni include some of the nation’s leading environmental professionals—and Alec Webster, an environmental studies major who graduated in 2002. With a strong focus on the environment and student experience, the Helen and Will Webster Foundation has supported multiple initiatives at UC Santa Cruz—including rebuilding the historic Hay Barn as a center for environmental programs. Five chairs have been established, four with environmental focus. The Websters say that Carson, like UC Santa Cruz, epitomizes love of the natural world, ethical judgment based on sound scientific principles, and the persistence and courage to create change. In these and previous gifts, the Websters have been inspired by the combined commitment to social and environmental justice they see on campus. That and the unmistakable passion they see in faculty and students for what they do. The Rachel Carson College Endowment will support environmental programs and initiatives that give students hands-on learning experiences and opportunities to examine policy and develop solutions that balance societal needs with protection and restoration of the environment. Two new chairs, which received matching funds from the UC Office of the President, will further environmental programs by training science communicators and by bringing attention to issues of justice. Partnering with the Websters in establishing the two new chairs are Mark Headley (Stevenson ’83, politics and economics) and Christina Pehl. “We are honored to join with the Websters to advance undergraduate education and provide opportunities for students to wrestle with today’s challenges of social responsibility and the environment,” said Headley. The Robert Headley Presidential Chair for Integral Ecology and Environmental Justice will be based in the college. The chair honors Mark Headley’s father, a longtime administrator at the UC Office of the President, and will be dedicated to educating students about the conceptual and applied aspects of environmental science and stewardship. The Science Communication Presidential Chair will be held by the director of the Science Communication program. The graduate-level program established in 1981 has trained hundreds of professional science writers and journalists, many leaders in their fields. It is the only such program in the U.S. that requires a degree in science and experience in research. It is the background that Carson herself had before she focused on writing. Within two weeks of its release in 1962, Silent Spring was a bestseller. The chemical industry struck back, launching intense attacks on Carson’s reputation and scholarship. While terminally ill with breast cancer, she calmly defended her work at congressional hearings. Among those deeply impressed with Carson’s work were President John F. Kennedy and Secretary of the Interior Stuart Udall. Years later she would be awarded the Presidential Medal of Freedom. Silent Spring drew its title from a striking decline in the nation’s bird populations—“the early mornings are strangely silent where once they were filled with the beauty of bird song,” Carson wrote. Just 18 months after the book’s publication, she died at age 56 at her home in Silver Spring, Maryland. Publication of Silent Spring followed a rich history of other contributions Carson made as a pioneering woman scientist. After studying biology at Pennsylvania College for Women, she earned a master’s in marine zoology at Johns Hopkins University, and studied at Woods Hole. She spent much of her career at what became the U.S. Fish and Wildlife Service, conducting research and serving as editor-in-chief of all its publications. A gifted writer as well as naturalist, Carson wrote extensively about the ocean and marine life, including her award-winning bestseller The Sea Around Us (1951). Her other work included Under the Sea-Wind (1941) and The Edge of the Sea (1955). Carson also wrote about the importance of sharing the wonder of nature with children—something she greatly enjoyed with Roger Allen Christie, her niece’s son, whom she adopted when his mother died when he was just 5. The Sense of Wonder, about her outings with Roger, was published posthumously. In the fall of 1963, Carson fulfilled her wish to see the California redwoods. Weak from her cancer and treatments, she travelled to San Francisco to speak about pollution of the environment to a major convocation of physicians. Afterward, from her wheelchair, she visited Muir Woods with a small group of friends, including fellow environmentalist David Brower. Fittingly, the University of California campus where a college now bears Carson’s name is shaded by countless redwoods and sits at the edge of the sea. 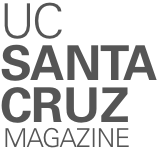 The Campaign for UC Santa Cruz supports excellence across the university through increased private investment in the people and ideas shaping the future. It is bringing critical new resources to the student experience, excellence in research, and the campus commitment to environmental and social justice.